I worked for British European Airways in London from 12/68-9/72. 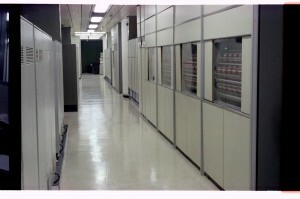 BEA ran 3 Univac 494 machines: one for ASRS (Automatic Seat Reservation System), one for CALC (Cargo Acceptance & Load Control) and FICO (Flight Information and Control of Operations), and a third machine used for testing and standby, which could be switched to either online machine. The machines ran a mixture of different models of drums. One type were Fastrands , about 2 feet in diameter and 6 feet long. I never knew how long they took to come up to speed, but it must have been substantial! BEA also ran smaller fixed-head drums; FH-432 (“Flying Head”, “Fixed Head”?) if I recall correctly. Each machine had dual drum channels, with writes taking place on both channels and reads taking place on the channel that would be fastest. Each machine had around 100 MB online. The processors used 30-bit words, split into 2×15-bits. An engineer told me that they actually used the same 36-bit memory as Univac 1108s but ignored 6 bits. 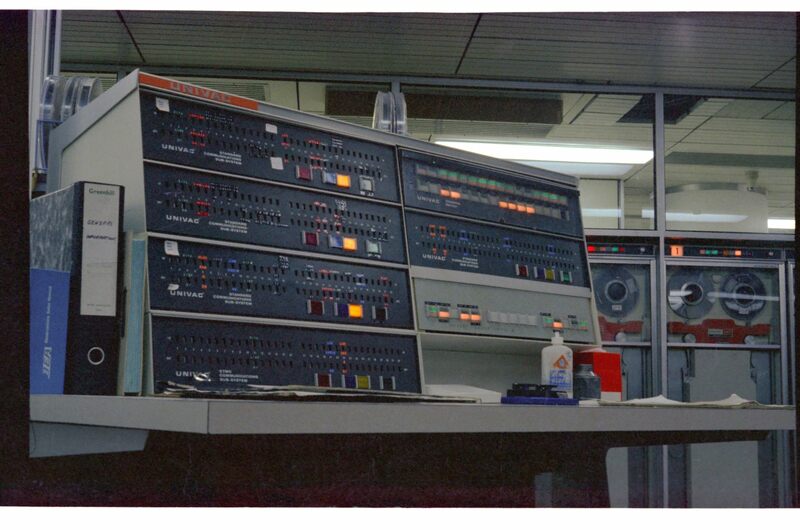 The predecessor Univac 490 had a 15-bit address space, and the 494 followed suit, but had 4 banks for a total of 2**17 30-bit words, or 480KB in today’s terms. I completely forget how bank-switching occurred, except that I have a vague recall of supervisor and user modes. It was a ones-complement machine, so it had both +0 and -0 (see fourmilab). It had a Stop instruction with 8 variants, of which #4 was unconditional. I never discovered the use of the other 7, but a system halt was universally known as a 4-stop. 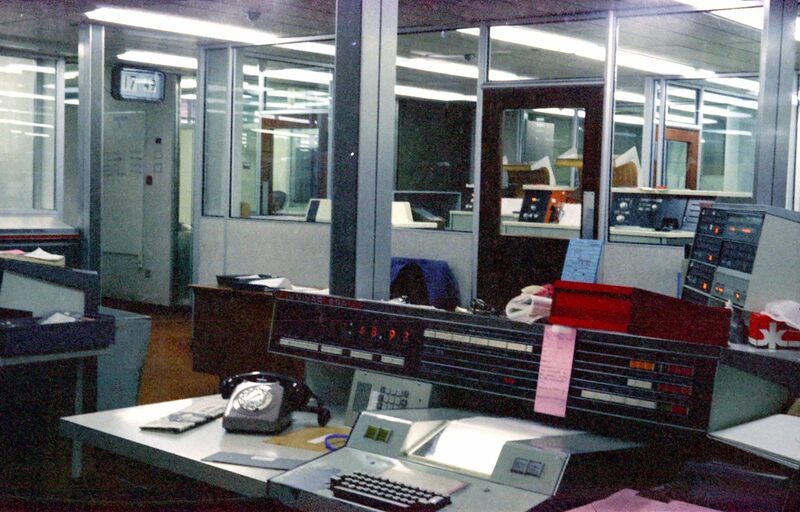 It was connected to terminals around the country (and possibly on the continent) through leased lines, probably at 110 or 300 baud, which came in through multiplexors, colloquially known as muxes. 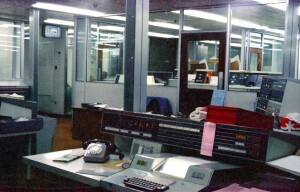 ASRS used special-purpose terminals which selected the flight by physically putting in a card representing that flight, but later systems used U-100 and U-300 terminals, the latter having no keyboard. The operating system was Contorts 7, which was developed in-house; whether from the ground up or based on a Univac system I do not know. Projects were written in SPURT IV, the assembler, or Neliac, an ALGOL variant developed by the U.S. Navy. Modules were swapped in and out of 3 3K areas, and data for the process was held in a transdata, or TD. I first worked on CALC in Neliac, but then moved to the comms team writing synchronous and asynchronous comms handlers, followed by a stint in a team providing 24/7 quality assurance and problem diagnosis for the on-line system. Reliability was an important factor, and each week a memo gave the availability excluding scheduled downtime. This figure was typically 99.5%, and I have a photograph of a colleague with the blackboard behind him boasting “12 DAYS WITHOUT A 4-STOP”. After I left, BEA merged with British Overseas Airways Corporation (BOAC) to form the current British Airways, and the reservation system was abandoned in favor of BOAC’s S/360 system. There is a great page about West London Air Terminal where these machines were located. Thanks for this page Phil. I worked as operator and senior shift leader on Beacon 1968-1974. Have been trying to get some images of the computer room, but very few online! I think BOAC and IBM tried to lose all trace! So nice to see your pics! Have many happy memories. Remember your name but not your face! Cheers, John. Hi John, nice to hear that you enjoyed this reminiscence. There’s a page on WLAT that you’ll like if you don’t know it already. Just two small points for you. I remember CALC as standing for Cargo Acceptance and Load Control. Control of Operations. This was still going strong when I retired in 2003 having gone through several rewrites and fundamental changes of mainframe platform. As I was leaving, it was being replaced with a (typical BA) all singing, all dancing, bells and whistles system which was far less robust or reliable. Thanks again for the site. Shame about the lack of 3rd floor WLAT pics. Hi George, glad you like the page, and thanks for the corrections. I’ve updated the page to reflect them. That’s quite a feat to port FICO across platforms. Thanks for sharing this. Really love reading about the history of Computing in British Airways and it’s predecessor airlines. Especially after obtaining a book about the later. If anyone comes across this posting that has any documentation, user guides etc.. on BABS please let me know as I’d like to start a site dedicated to the history of BABS. Hi Adrian, it’s great to have the occasional visitor come by and enjoy the notes. When you get your site up, leave a link here for people. I started as a trainee programmer on ASRS on 26 August 1968. I then moved to the CALC (cargo handling) project and then DISC (Defect Information and Serviceability Control). By then BEA had been taken over by BOAC and we were on IBM 360/370. I worked at WLAT and left to join ICL (as did many of my colleagues) in 1977. This brought back many memories. From ICL I eventually moved to Oracle and still work for them. Of course I remember working in the same team with you Phil, despite the name change. FH-880’s come to mind. And I remember John Grafham and many others. Core dumps were known as ‘sickdogs’ for some reason. Hi Charles; this new-fangled internet thingie is quite something, isn’t it? Amazing to connect across all these years! Yes Phil, we have come a long way from the punched cards and flicking rubber bands at each other! 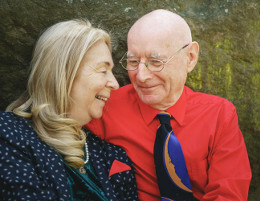 I joined at the same time as Charles B in 1968 joining a team in ASRS with team leader Ros Minchin, will we ever forget Charles? Some will remember TDSUPBs and also the Transaction Utility (TU), an attempt to produce a proper database system. The 30 bit registers could be joined in what was called double precision coding; I still have my SPURT code guide somewhere. BEA was a really good organisation to work for and its a shame it was subsumed into BOAC and the whole thing rebranded as BA. Yes Keith, I remember Ros….. We were just given a few programs to update but nobody really gave us any real training so we just sort of sat there and looked at them, wondering what to do. On joining, we went on a programming course with Monty Cooke. Half of the trainees were to go to the ICL side (using PLAN) and our half to Univac (using SPURT). Monty devised the brilliant plan of combining the two languages into a hybrid which he called SPAN. The result was that we were all thoroughly confused and didn’t properly learn either language. Happy days! My grandfather – Dudley Dalton – worked at BEA / BOAC and was involved with the installation of the Univac computer system and subsequent upgrades (and then went on to work for Sperry, presumably as a result). I will find out which years he was there but I wonder if anyone on here knew him? He was previously in the BOAC maps dept at Hendon / Heathrow and had worked for the airline at Gatwick (in the beehive) when it was BA first time round. In fact his connection with Gatwick went back to about 1930 when it was a grass strip. (Got some pics from those days too). I will try and find out more about the computer system and post it sometime. I also have a lot of old photos of the assembly, installation and operation of those old systems plus the original press shots of the grand delivery (by crane through the windows of the BA bookings office on Cromwell Road. Sounds like it might be relevant here and of interest to Adrian Smith, Keith Robinson, George Latimer amongst others. Very happy if anyone wanted to be in direct contact on this subject. I have a whole box full of pictures to go through and lots of internal communications on this topic. I’m based in Cornwall. You may like the page on WLAT too; I’ll edit the post so that other readers will find it. PS I did find this brochure for the Univac 494, which may be of interest…. That’s very cool, Nick! I have a Beacon brochure stashed away somewhere, though after many house moves I am not quite sure where… If I find it I will scan it and send it to Phil to post here. I worked at BEA as a senior operator. John Grafham was my boss along with others including George Stewart. This sure brings back fond memories. I was a systems programmer for SITA from 1979 to 1984. SPURT was my second all-time favorite language, just barely behind IBM 1401 AUTOCODER, and slightly ahead of Univac 1100 MASM. It’s great to see that others are around with good memories of the 494! I started out with 1401 AUTOCODER. The 1401 had some interesting capabilities. I remember joining BEA and being shocked that I couldn’t move a block of data at one go, but had to do it a word at a time. Aargh, when I was young, I lived in a paper bag in the middle of the road with only 8K of memory.